From a teenage student guiding companies to their exhibition spots on his bicycle at bauma 2014 in Munich barely ten years ago, to being in charge of organising the Indian edition of the global equipment fair – dubbed bC India – IGOR PALKA, CEO, bC EXPO INDIA PVT. LTD has come a long, long way. The young exhibitions veteran offered CONSTRUCTION OPPORTUNITIES, India’s leading construction equipment magazine an understanding of his organisation’s efforts to build the bauma Conexpo brand in India. Construction Opportunities queries regards the assessment of bC India which will now be into its 3rd edition? I would say we are still comparatively young event but the good point with brand bauma – which is well established – is that we are also well known now as bauma Conexpo. We are offering the platform in India which we used in Europe or in China and now also in Africa. Therefore many people know what we are talking about and we don’t really have to market ourselves further as to our identity. What is the distinction that you draw from other bauma Conexpo editions abroad and what does India mean as a market to you? We do our analysis of how much the potential is. If you look at the most recent Five Year Plans that the Indian government is addressing you will see there is a great emphasis on infrastructure projects. There is so much that needs to be built here. It has been so for the last 10 years and will continue for the next 20 years. India is a country set for a boom in development. Of course the pace will depend on the government’s approach to execution of projects but we do know that development and growth is assured. It also means from our perspective that India has great potential as an exhibition destination. India because of its huge market size has always been on the bauma radar and it was only natural that we had to be positioned here. Give us a sense of why and at what point your headquarters in Munich thought of India as an exhibition destination? I am not sure how the dateline looked like by that time, but I think by a certain point of time during the last 10 years we had pretty much analysed India and thought of launching our exhibitions here. After seeing hundreds of thousands of visitors at our home base in Munich – which this year is celebrating its 50 th year – we decided that foreign business was also important. We thought: Why should it be that the customer should always come to you? Why not go to the customer? Of course that is when we thought of exporting our events abroad. China was the market which we explored first when we opened our subsidiary office and extended our bauma brand there launched bauma China to showcase construction equipment and construction machinery. bauma China happened with a comparatively smaller event than in Munich but it grew comparatively fast in terms of size – it is 60 per cent the size of bauma in only 5 or 6 editions when bauma itself was in the 30th edition. This development happened during the last 10 yrs and we thought it could happen in India as well, there was no doubt about that, so we brought it to India together with our American partner AEM. The process took some time because we had to set up the legal company, find office premises and such things. Then five years ago the execution happened quickly. Then we started with our subsidiary MMI India and just one show – Electronica – which further grew to 8 shows. I think every company in Europe and the western hemisphere now is led to think that it has to move to India – and that such a step should come sooner than later. India is a virtual continent, you don’t jump in and gain results within one year because you need to adapt to the local market in the local way. You grow with India. Things don’t happen here immediately and you have to think of investing for the long term to gain benefits. And that is why we are inspired to be here. Construction Opportunities queries about the contours of your partnership with AEM? bC India is a joint venture between Messe Muenchen International – which holds 66 per cent share – and the Association of Equipment Manufacturers of the USA. AEM had the expertise and knowledge of organizing the biggest event on the American continent with CONEXPO-CON/AGG. We had the experience and expertise of organising the bauma Munich for a long time and we are competitors for other event organisers but when we launched in India we decided to work hand in hand with AEM which has a presence in Asia and in North America. 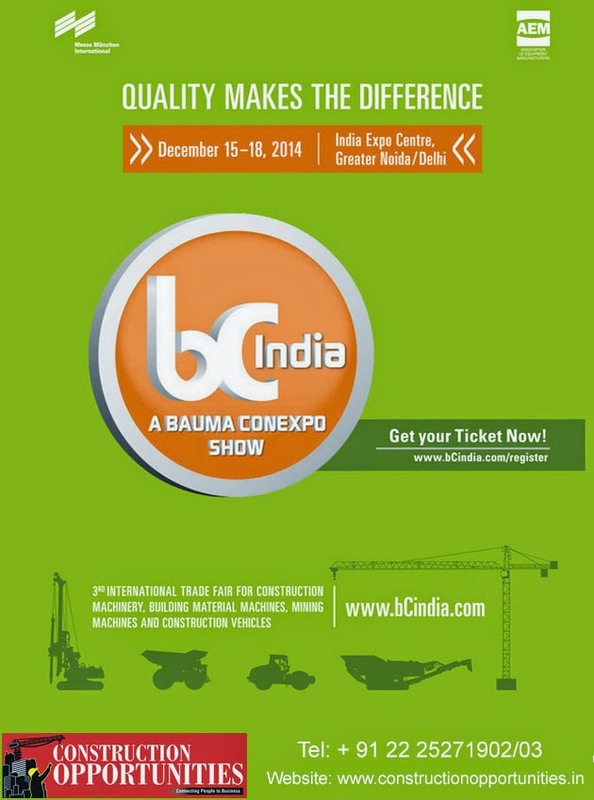 The joint event was renamed bauma Conexpo India. We have done a similar thing in Africa. Because we are from the same industry we are close partners with AEM. We combine our knowledge and expertise and customer base to function effectively. Can you tell us about the progression made in two previous editions of bC India in terms of delivery of your objectives? We launched our first event in February 2011. Obviously there were many challenges since we were doing it in India for the first time. There were certain expectations from Europe from the brand bauma after our tie up with AEM. The first event was an extreme success. We had 508 exhibitors and the visitor turnout was around 22,000 in 80,000 sq m of exhibition space. That for a first event was amazing and it over achieved our expectations. It was a perfect launch for bC India and two years later in February 2013 our exhibitors grew to 710, a jump of more than 200 companies. In terms of visitors we grew to over 28000. This gives us the indication that we are on a right track and that the brand is moving forward and becoming stronger. The feedback is always great. We have one slogan: ‘Quality is the difference’. I think that is what companies expect from us as organisers. We want to further raise the bar of quality of an event and this is something that we are working on everyday here. These two events happened at a particularly sensitive time of history – the global economic meltdown. How correct would it be then to categorise the two bC India editions as a success? The first show was more than a success. It over achieved our targets. We had a waiting list of companies. We were not expecting that kind of response. The economic situation went down in 2012 especially the 2nd half. 2013 was expected to be flat as well but what happened at the second edition was that the companies were considering to cancel or to reduce exhibition space. That also happened to a certain extent. Companies said it’s getting worse but they still wanted to remain with the show and instead of 2000 to 1500 sq mtr decided to go with a little less. They still remained with us because they knew it was important to have a strong connection with us and we thank our customers for that. Otherwise we couldn’t possibly have increased exhibitor size to 710 companies although the economic situation was not in our favour. Yes, the show could have been much better in terms of visitors but we are still happy with the outcome of both the events. We were then only on our 2nd birthday and could say we were developing. I remember your colleague Thomas Loeffler telling me after the 2013 edition that it was a success in terms of the quality of visitor turnout? That is correct. What we do is that we are selective and don’t open our doors to everybody. We could easily have achieved 35,000 visitors. The point is we are a business to business platform on which the top people of the industry come together. Here quality makes the difference not only in terms of organising the event but also visitor wise. As an organiser how do you assess who is the right exhibitor – is there a process of weeding out involved? We know most of the exhibitors very well because we have a very good relationship with each one of them from the past through organising shows in Munich and in Las Vegas. From our database we know about the companies in various categories and the products they represent. Of course there are new companies – small and mid-sized – which we don’t have on our monitors who send their applications, but we have a system of checking who they are and what they are doing – because if we have them on the show we don’t want others feeling uncomfortable. We would like exhibitors to fit into our portfolio and try to ensure there is no mismatch. We don’t want a wrong perception of our show and therefore have a whole set of requirements for exhibitors to meet. We have guidelines for various categories and sub categories of products related to their position and placement on the fairgrounds – we try to club various product categories like vehicles, building construction equipment. When an application form is accepted from a company we don’t spread them around loosely on the venue but combine them in locations where it becomes easier for visitors to focus on a particular group of products. So companies in scaffolding or form work will be pooled together. Some companies may not want to be next to an XYZ company – that is tricky and almost like a puzzle for us to unravel. So we are allocating space keeping in mind sensitivities offering a perfect overview of the product market. You mean companies are very touchy about things like their positioning on the exhibition chessboard? of space in terms of size, the position of its stand in the exhibition zone, even things like the identity of the company in the stand next to it. If we were to follow all their demands things would become so difficult for us. We have to do a lot to convince them in order to cater to the requirements. It therefore makes strategic sense for us to clear the big blocks first. We allocate big companies with stands and only after their approval is obtained we proceed with the placement of mid sized and small companies. That would naturally mean a lot of advance preparation for the next event here? We started for bc India 2014 in September last year. We require 15 months of preparations. The pace is slow initially: you send the application forms, get in touch of the companies, and work with them after receiving their applications. The pace increases as the show gets closer. It has been quite a learning experience for me in the short period I have been here. I was a little worried in the beginning because I was used to the application period in Munich where right after sending out the application you received 100 back within a minute. Here that comes a little bit more towards the end. With so many holidays – Diwali and Christmas – and other events like elections taking place companies want more time to make a decision as also to monitor the market. But I am happy they are finally coming back to us. Construction Opportunities queries regards to the feedback that you have received as of now - what are your expectations from the next edition of the show? We have to be realistic in our expectations. The market hasn’t picked up that dramatically as compared to the last event. We hope to increase the turnout both in terms of quality and quantity. That is the deliverable expected of us. We really would like to cross the 800 mark but cannot be very sure. The next edition is at a new venue and we need to understand that we are dealing with an entirely untapped market of visitors coming from the north. As far as expectations go, with a new government in place and projects being announced everybody anticipates 2015 to have a significant growth rate – and that from an exhibitions perspective is good news for us. How is India as an exhibition hosting destination? Exhibitions have been recognised as a very good marketing tool by companies in Germany as indeed in much of Europe. Because of the regular conduct of such exhibitions which leads to buyers and dealers meeting each other the business has reached a very high level of sophistication. I think this understanding of the benefit of exhibitions must still grow in India and if there are proper venues for the conduct of such exhibitions. India is a very big country it needs more facilities to measure up to the requirements of international visitors. What are the challenges you face as an international exhibition organiser in India? The main challenge of course is the absence of proper fair grounds. We at Messe Muenchen are always keen to know of development in terms of trade for exhibition centers all across India especially for a show like bauma for which you need proper space. Ideally we would look for a venue of 200,000 sq mtrs. We would like indoor facilities with high ceiling hangers and without pillars and with a high loading capacity where all the huge machinery can be displayed. We would also want a levelled concreted outdoor area with a drainage system and electricity supply, connectivity in terms of roads and other infrastructure, proximity to a port, airport and hotels nearby would be great. Everything has to be monitored and it’s quite a challenge to find a proper venue. We are now doing the third edition of bC India in Greater Noida. We will see how it works and we are pretty confident that it will work out well. Could you explain the choice of Noida as a venue over Mumbai? From the temporary structures that we see in Mumbai we will experience an increase in quality at Noida because of the existing fixed infrastructure available there. We don’t have to build anything like halls and toilets. Then we have a huge outdoor area with concreted grounds so no leveling is required. 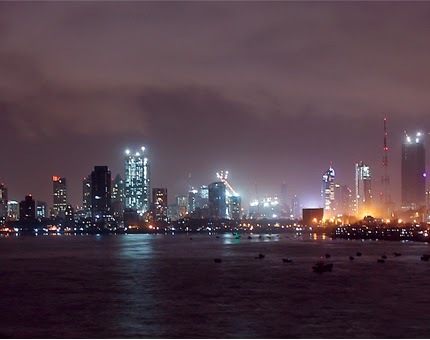 Indeed the support offered by the venue is very big – and that is the main reason why we picked it over Mumbai. Besides it made sense to look at the untapped market of the north. Won’t the absence of a port close to Noida pose a logistical challenge? We would have to calculate 2-3 days more than it would take for a venue like Mumbai to move material by road. It is so easy to transport equipment to BKC than to bring it to Delhi. Of course we have very good support from our logistic partners and forwarding companies. Construction Opportunities asks about the support that you are receiving from urban local bodies and the government? The Builders Association of India (BAI) which is a co-organiser has been very supportive of our project since the first event. We are also working closely with iCEMA and other international associations which support us by bringing delegations. We have received tremendous support from industry and from various government bodies in the past and we expect the same this time around too. We are also in touch with various diplomatic missions to have the head inaugurate the various national pavilions. For example, we hope to have the German Consul General to welcome the local companies. Tell us of the turnout of Indian companies at bauma’s parent show in Munich. What are the prospects of India raising its exhibition venue profile? Very obviously your idea would be to surpass the previous experience. How are you looking to do it in the next edition of bC India? I have to admit that for me some things are usual because the show is for the 3rd time. However I am organising it for the first time and doing so at Noida, which is a different venue with new local authorities to deal with, is like conducting an event for the first time. We would most certainly want to improve the quality of the event. We know from the monitoring of past events what we must do and what we should not do, so we are very well guided. Luckily enough, I have the same team working on the project as the previous two editions. We will try to bring in fresh ideas based on our past experience to make this upcoming event a great success. We definitely have a few plans up our sleeve to raise the quality bar at the new venue.